Even if the lower part moves with hooks, it will move, so sorry regrettable seems to be small, but I think that it is a good product not problematic on use. This review is about item#37720907. Since the position of the lumbar pad is not so good, it does not fit the waist and when the room temperature rises it is hot that the colonnade is hot and sit still. 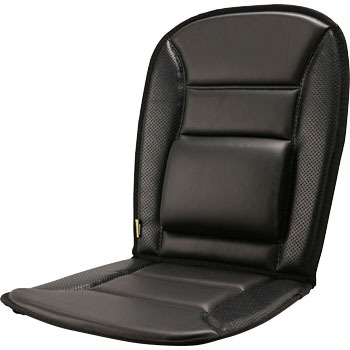 Also, since the fabric is thin, it will not increase the rigidity of the seat that has come up. The good point is that if rubber can not be cut, it can be fixed without slipping and it is cheap. The winter's coldness of the seating surface vinyl for the purchaser was greatly reduced. When connecting both ends of the folded part of the back and the seat with the seat part of the seat and the connecting part of the back with the insock, it does not shift at the time of getting on the ride. It is a pity that the swelling of the back lumbar support will be below the waist waist (hits the trouser's belt) because it was installed on the track seat without subduction. I think that it is better than the price. I am satisfied with the time I did not expect much. The waist cushion is exactly right. The seat surface is a little bit thicker, but I think it would be fine, but it got better if I caught a cushion cushion underneath.